What is an Unwarranted New Orleans Condo? It is a term used in financing….Important to know and understand…. An unwarranted condo is one that cannot be financed as a Conventional Mortgage that is sold to Fannie Mae. A condo can become unwarranted for a variety of reasons. Some reasons are valid and some will make no sense at all. There are a number of reasons that a condo is considered unwarrantable. The Unwarranted label does change for a variety of reasons. If the reserves of a condo association falls below 10% of the budget then it will not be approved. This happens in smaller associations when reserves get low due to spending on a big one time item and not doing an assessment. Condo associations need to build reserves as expenses keep rolling in. If over 25% of the units are rented then it becomes harder to finance as it does fall then into the unwarranted category. This tends to happen at the low end of the condo market when you have too many investors. It the condo association is new and under 75% of the units are not yet sold then its unwarranted. This one makes little sense in our market when there is not a lot of inventory. It hampers new developments and developers. However if 75% of the units have contracts then it meets the goal. Lawsuits that are against the condo association where a value of the suit is hard to determine. Its attorney’s holding up the condo association to get their way. Many times the suit is for nothing but hurt feelings and will end up trashed. But attorney’s like to push their point not caring on who they may hurt those trying to sell ones unit. One such suit is one where the attorney had not paid his dues in 5 years and sued the association for harassment when they kept asking him to pay up. He ended up paying in the end. The Lofts at 402 Julia Street on one of my sales let the reserves go below 10%. it was corrected in a matter of weeks and the association was approved. This was an easy one. The condos at 835 Julia were new and there were few lenders in 2008 that would loan on the building. Absolutely nothing wrong with the project or the association other than being new. One good thing has developed with several local lenders that hold the mortgage and do not go through Fannie Mae. They still check the insurance that the condos have but look at the person as to determine the value of the loan to them. Most of these will require 20% down but have low closing cost since they are not selling the loan. I have all the names so I am able to get most people over this hurdle. These are the most common reasons that I have run into when trying to finance condos and am sure this has to have something to do with the present shortage of units for sale. The Rotunda is the latest in a long line of condo conversions of Warehouse District apartments. The old grocery warehouse is in the center of the New Orleans Warehouse District at 330 Julia Street directly across from Julia Place. Emeril’s Restaurant is actually one of the business condos on the first floor. The Rotunda has 68 units split between one and two bedroom units. You can still get a decent size one bedroom in the 200k range. The two bedrooms are going to be closer to 300k. I am not the listing agent but have sold a couple in the building who looked at all the choices in the Warehouse District and chose here for the location and the size of the units. There are currently a variety of units for sale. All of the units are on floors 2 and 3 with the penthouse units on the top floor which is floor 4. The garage and retail spaces are on the first floor. The more expensive units have garage parking and the others have contract parking availiable across the street. Close to 50% have garage parking. A garage space is the New Orleans Warehouse district can easily be valued at 20k. The spaces across the street at Julia Place sold for 25k when the units were for sale. The amenities include a roof top deck which gives you a great view of the skyline fronting Julia Street. There is a small plastic pool on the newly renovated deck. The community room is also a nice feature with great views on the penthouse level. The fitness room is on the first floor as you enter from the garage or the Julia Street entrance. Condo fees are moderate and include common area upkeep, elevators, exterior building upkeep, insurance, water, and overall upkeep of the area. Most of the larger units and two bedrooms have exterior views. The interior view units do get plenty of light which makes the spaces very bright and seem larger than they really are. All the units have higher ceilings and enough windows. You can get the more expensive units totally redone with many updates and upgrades. There are a group of units around the 200-220 range than will have some updates but to keep the cost down are not totally redone as the more expensive units. The MLS shows 22 sold 23 active units. There are some units that are not on the market yet due to leases and are being cleaned up. In the early stages of a conversion there is a lot of work, painting, flooring, upgrading going on all over the common areas as the developers upgrade from the apartment feel. Once done the common areas are 100% better than the early stages of a renovation. New Orleans Condos in Uptown New Orleans are in good supply. There are currently 325 condos in all price ranges and types on the market. There are several complexs that got listed twice in the MLS as they are with two agents giving the raw numbers a rethinking. There are 85 sales and units currently under contract this year. This is the time of years students, residents, and people in general put their places up for sale. These figures contain new conversions, some pre-sales and mainly resales. This is also the time of year that creates the most interest. There are 134 units under 200k for sale. This is an odd figure in that they are 67 units priced under 160k which is a very hard price range normally to find things in. There are several larger complexes where there are many units for sale. In the 1750 St. Charles Ave. there are 21 units for sale currently. 1205 St. Charles has 14 units for sale. This is a converted hotel near the Warehouse District. There are several new complexes of 8-10 units along with several four plexes that are also new. The L’Orange at 1544 Camp has 10 units. The new constructions at 1633 First Street has 11 units. The historic conversion at 1520 St. Mary has 8 units. The 1717 Religious condos in the Lower Garden District has 10 units. You can combine all the new condos and you have at least 50 new units. The new units put pressure on the older units that have not been updated. That is why I think there are such a large number of units below 200k for sale. Location and condition is still the key for future appreciation. There however will not be that many for a criteria that you may have as we cull out the bad locations and overpriced units. With this said there are some deals to be had. Numbers are numbers unless you get a true insite inot the niche markets such as the New Orleans Uptown Condo market. Todays Uptown Flowers add to enjoyment of the showings in these historic neighborhoods. Harahan Condos, Colonial Country Club and the Belle Rive Condos. Proposed Condo Project? Plans for the Belle Ive Condos have been proposed by Lauricella Land Co. to build a 17 story, 154 unit-Luxury Condominium project with an complete upgrade to the Colonial Gold and Country Club golf course. The units will range in size from 900 sq. ft; to almost 2400 sq. ft. The prices will start at $350 per square foot. The Redford Group, a Birmingham, Ala.,-based golf development and management firm that had a hand in the Robert Trent Jones Golf Trail, and golf course architect Nathan Crace of Watermark Golf in Jackson, Miss. Building architecture was handled by PageSutherlandPage out of Houston. Parking to the complex will be a three story parking garage with 300 covered spots plus additional spots in a parking lot. The top of the garage will be an amenities deck where residents will have access to a pool, spa, outdoor kitchen and gardens. “The current Colonial clubhouse would be demolished and replaced by a facility on the ground floor of the condominium tower, Lauricella said. It would include an expanded lobby, a restaurant and bar, men’s and women’s locker facilities, lounges and a 5,000-square-foot fitness center. ” according to the Times Picayune. Being a resident of Harahan, I think its a great idea to have something like this. The course can be upgraded to first class place for golfers. It can attract people from all over the area that would like the condo life style in an upscale development. It should be some great views of the Mississippi River as the land is on the river. Keeping the golf course is great news as a housing development would not be in the best interest of Harahan. The Trump Towers Sales office is opening in a couple of weeks at 601 Poydras in the Pan Am building in the New Orleans Warehouse District. A recent article in the Times Picayune recently said about the project. “Donald Trump Jr. said the condo-hotel units should appeal to executives from the energy sector who visit New Orleans regularly and want to keep a pied-a-terre in the city. With the dollar weak and interest rates low, Trump also expected investors from Europe and Latin America to buy inside the building. He said well-heeled locals, especially those with grown children, might also consider moving downtown. Condos and condo-hotel units will start at $400,000 for a studio and top out at several million dollars for a penthouse. Once 50% of the units are sold the project will begin the next phase. Look for a lot of out of state investors to purchase these units for themselves. When you have a new project of this scale the entire area gets more notice. Will we see the New Trump Towers Condos added to the New Orleans Warehouse District skyline in the future? New Orleans Condos, Trump Towers Condos and Hotel Update! The Trump Towers Sales office is scheduled to open in the New Orleans Warehouse District in mid-Feb, 2008. The new Trump International Hotel and Tower at 555 Poydras Street will be followed by many around the world. The developers hope to break ground later in the year. 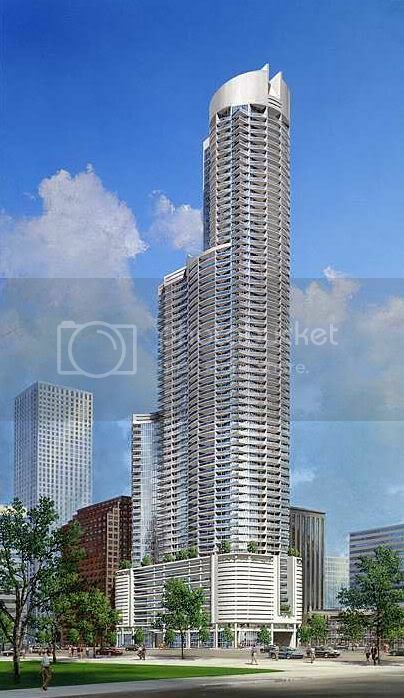 The 72 story tower will have 290 standard condos and 435 condo-hotel units. The first 2 floors will be retail followed by 12 floors of parking with over 700 parking spots. A group of floors will be the hotel and the upper levels will be residential condos. Many of the units should have great views of the city and River. In mid December there were 175 deposits. Interest is expected to pick up once the 5000 sq. ft. Sales office is open. Its a unique project especially for New Orleans and should be known by most people in the world. Anytime you get a World Class project in the area is should give the entire Warehouse and downtown New Orleans a boost. Maybe I can meet someone who buys the one of the upper floor units to have me over. Maybe Irene Rand, one of the sales agents will give me a ride on the construction elevator if I can sell a couple of the units. Lets support the efforts and hope the developers can pull this off. Wow! A 19 million dollar project is announced for the New Orleans Warehouse District involving Idea Village and St. Joe Lofts which will be office space and loft apartments. Idea Village is a non-profit group that supports entrepreneurs to develope their business ideas. The Idea Village will occupy the first floor. The development will include 45 affordable units available to people earning under $35,000 per year or 60% of the area medium income. These are the sparks that our downtown area needs and is getting on a monthly basis. The Idea Village and St. Joe lofts will begin construction with the next 2 months at 400 St. Joesph Street near Constance. The developer is Jay Trevor with J&T Development. The innovative project is expected to be complete in March 2009. It makes great sense to give people starting a new business an affordable place to start in the Warehouse District. Many of the former apartments and lofts have been converted into condos creating a healthy demand for rentals in a very innovative and creative part of town of town. Each addition is a building block in this neighborhood and to creating new jobs that will allow more people to buy. Its private enterprise that creates jobs.